Martha Halim lives in fear. She is terrified of the moon's phases, afraid of eating and fearful of fires, rivers and ponds. She is stricken with mysterious seizures that frighten her from eating. Her parents have tried everything. She's been to a hospital, she's seen a Western doctor and she's taken anti-epileptic drugs. The 13-year-old has even been to witch doctors. She followed the advice of one, crawling through a termite mound while her parents slit the throat of a goat. She gives a grim description of what it's like when her disease overpowers her. "When it comes, it looks like a black cloud but in the shape of a human," said Martha. "That's all I know. At the end, I find myself on the floor." Martha suffers from a strange affliction called "nodding syndrome," apparently unique to southern Sudan. Its young victims tend to nod vigorously at the sight of food. The condition often progresses to severe seizures, mental retardation and death. Martha fell into a fire last year when she had a seizure while cooking. Her right leg is disfigured by a severe burn from knee to foot; she protected it with a soiled beige rag. Her father, Neen Majak, says he has nearly given up hope. Anti-epileptic drugs haven't helped and neither have the remedies of witch doctors. The affliction, which has been found in about 300 children so far, baffles experts. The World Health Organization began investigating it about two years ago, around a year after Martha's symptom first appeared. Peter Spencer, an American neurotoxicologist who has investigated the condition for WHO, encountered another 13-year-old girl with a bizarre variation of the illness. "I was able to demonstrate with her that she was a regular nodder with local food and by contrast she did not nod when eating a variety of American food — candy bars or whatever. It was absolutely staggering," he said. As she sits on a sisal mat with her parents under the shade of a tree beside their mud huts, Martha says no treatment has helped her. One traditional healer claimed that Martha's aunt, who was killed by lightning a few years ago, had bewitched the girl. Following his advice, the family held a ceremony attended by the entire village and sacrificed a sheep. Recently, another traditional healer told the family to take the girl into the forest to wash the bad spirit away. "He told us to bring a black goat and a red hen and make a tunnel in a termite hill," Majak said. "She crawled through the hole back and forth three times. Then we had to kill the goat and the hen in sacrifice." "You can consider her a dead person, because she is not going to marry and she is going to die of this disease," her father says. "If this treatment doesn't work, then all I can do is wait to let the child die." Experts say a few children recover. Doctors with WHO think the disease may be related to a disorder seen in Uganda called Nakalanga syndrome, which also has symptoms of convulsions, stunted growth and sometimes nodding. Spencer's investigation has found no obvious environmental causes. He wouldn't rule out a food connection, but said it is unlikely. "What was striking is that the majority of the population that is affected by this disease in southern Sudan has a different lifestyle from the itinerant Dinka people, who are sort of herders. They are not affected by this disease," he said. Spencer said one theory that cannot be ruled out, although it is not a leading suspicion, is the disease could have come from eating monkeys. Ebola can be spread to humans by chimpanzees. AIDS also made its way from primates to humans. 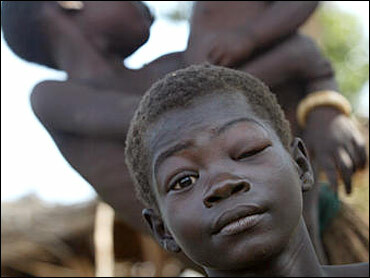 Spencer and other investigators believe nodding syndrome could be connected to river blindness, a disease transmitted by the blackfly, which is particularly widespread in southern Sudan. Martha and several other members of her family are afflicted. Unraveling the mystery of nodding syndrome is a question of money and time, Spencer said. "If we're smart, we will unravel it. We won't let it burn on like we did HIV," he said. "You just cannot imagine a greater disaster for a community than their children being hit in this way."